Filmglaze is a low cost, economical secondary double glazing system. It is very simple to fit requiring only a sharp knife and hairdryer to install. A double-sided adhesive tape is placed around the window to be glazed and the special film supplied is stuck firmly to this. Using a normal hairdryer the wrinkles in the film are ‘heated-out’ to leave a tight skin of film over the window frame. Small: 1.5 x 1.2M film, 8M of double sided adhesive tape. Medium:1.5 x 3.0M film, 16M of double sided adhesive tape. Large: 1.5 x 6.0M film, 24M of double sided adhesive tape. The kit contains a sheet of film, double-sided adhesive tape and full fitting instructions. As well as Secondary Glazing Fittings • Filmglaze Omega Build supply a range of roofing components such as roof lanterns, roof domes, diy conservatory roof kits, polycarbonate roofing sheets, polycarbonate canopy kits, door canopy kits and much more. I would recommend your affordable products (Secondary Glazing Fittings | Filmglaze) to anyone else considering this product, as it has been superb. Omega Build Shop | Secondary Glazing Fittings | Filmglaze. 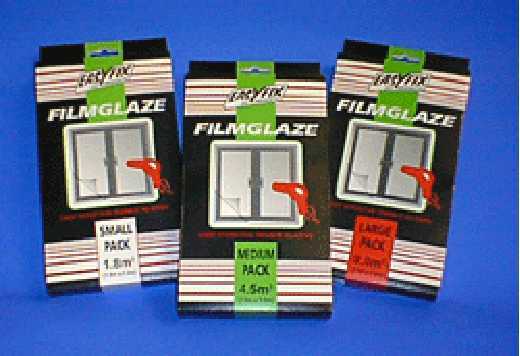 You are viewing Secondary Glazing Fittings | Filmglaze, buy online today!